12 noon, Holy Trinity Church, Rathkeale, Co Limerick. Readings: Acts 10: 34-43; Psalm 118: 1-2; 14-24; Collosians 3: 1-4; John 20: 1-8. In the name of + the Father, the Son, and the Holy Spirit, Amen. How many of you find it difficult to get up early in the morning? I used to find it difficult to get up early on two different types of mornings. There were those mornings when I was a schoolboy and I knew I had not done my homework. I found it difficult not so much to wake up as to get up: to face up to my responsibilities, and to take the consequences of not meeting my own responsibilities. And there were those mornings I found it difficult to get up because I had been allowed to stay up too late the night before. I was not in trouble, but my body sure was. But, looking back on my childhood, there were mornings when it was not difficult to wake up early in the morning at all. What about you? ● Christmas morning was an easy morning to wake up early. Perhaps looking for Santa’s presents. It was exciting. There was a lot to look forward too. ● Your birthday: birthdays are always full of surprises when you are young and full of life. ● The morning of a big football or hockey match, or a music competition you had entered: and your stomach was full of butterflies. ● There was the morning when we were starting our holidays: when I was at the beginning of an exciting time, setting off on a journey, somewhere wonderful, when I knew it was going to be exciting and I was going to have a great time. ● Being woken up in the dark, fearing what is happening outside, or even in the house inside, those nights when you are unable to get back to sleep, wondering and worrying about what has happened. ● Before going into hospital to have a test or an operation. ● The night before a funeral, especially the funeral of someone you love and who has been close to you. These are sad times to remember, although years later we are glad those doctors operated, glad to look back with fond memories on members of our family, because long after they have died we still love them and their love for us is still real. In our Gospel reading this morning, we are told how Mary Magdalene was up while it was still dark, long before morning had broken. It was Passover. But her reasons for being awake while it was still dark and for rising early are not because of any holiday excitement or expectation. She could not sleep the night before because someone very precious – the most important person in her life – had died. And yet this story moves from one that begins with being one of the saddest reasons for getting up so early, to being one of the most joyful reasons for being up early in the morning. At the beginning, it is as though she was going through the worst of times in her life. But then the story suddenly changes. It is as though all her Christmases, all her birthdays and all her holidays have come together, and much, much more. Jesus has died, died in the most awful way, late on Friday, and he was buried late on Friday evening, just as it was getting dark. Then, Saturday was a day when no-one in the Jewish world could do anything. You could not open the fridge, turn on the light, cook the dinner. The small group of people who had buried Jesus had to wait until early on Sunday morning to go and sort out things at the grave. Well, Mary did not get to sort them out. Because it had been such a hurried burial, things would have been in a mess. He would not have been put in a proper shroud. His eyes would not have been set closed ... all those messy things that most of us do not have to even think about these days, thanks to the professionalism of funeral directors. And Mary went to the tomb, probably bringing with her spices and nice clothes, and things like that … things that remind me of the swaddling clothes that Jesus was wrapped in as a baby, and the spices the Wise Men brought to him as his first birthday presents on that first Christmas. And when she gets to the grave, there is a greater shock waiting for her. The stone has been rolled away, and the body is missing. Could someone have been there before her? So, she runs back and tells Simon Peter and John the Beloved Disciple. Now, I have to admit, we men are not very good at making deductions – at looking for the whole picture. When these two men look inside the tomb, at first they take everything at face value. They see the neatly-folded linen wrappings and the head cloth in the grave. We are told that they see and believe. But belief does not lead to faith or action. Instead of looking around to see where Jesus might be, what do they do? They return to their homes. If we had relied on what they had done after what they had seen, would we have ever realised the significance of that first Easter? They look inside, they see an empty grave, and then they go home again. But Mary has come back to the garden, and decides it is worth hanging on to see what has happened. And because she waited, because she wondered, because she questioned, she was there to have first encounter with Jesus as the Risen Lord. She now realises what it was all about. What those past three years with Jesus were all about. What Jesus was trying to say to them all the time as he preached, as he told them parables, as he healed, as he went fishing, as he had meals with them and as he fed them all. Can you imagine her excitement? A dark night of waiting has been turned into the most glorious morning. The spices and clothes they were bringing are no longer needed. Instead, here is the most wonderful present possible. Human hate been defeated by God’s love. Oh that we would all want to cling onto the Risen Christ so tightly. Oh that we were all filled with such joy in Christ, not just on Easter morning, but every morning. Because nothing can ever be that bad any more. Because God loves ... you. Easter means that all the fears we have in the middle of the night, all the fears you have early in the morning, are nothing compared to how God wants to take care of you, mind you, love you, to have you cling on to Christ and for Christ to cling onto you. God has rolled away all the big stones that get in the way between you and him, between me and him, between us and him. We only have to look for ourselves and to believe. And that is why Easter should be better, is better, that all the Christmases and all the birthdays and all the other special treats rolled together. And so, may all we think, say and so be to the Glory of God, + Father, Son and Holy Spirit, Amen. 1 Τῇ δὲ μιᾷ τῶν σαββάτων Μαρία ἡ Μαγδαληνὴ ἔρχεται πρωῒ σκοτίας ἔτι οὔσης εἰς τὸ μνημεῖον, καὶ βλέπει τὸν λίθον ἠρμένον ἐκ τοῦ μνημείου. 2 τρέχει οὖν καὶ ἔρχεται πρὸς Σίμωνα Πέτρον καὶ πρὸς τὸν ἄλλον μαθητὴν ὃν ἐφίλει ὁ Ἰησοῦς, καὶ λέγει αὐτοῖς, Ηραν τὸν κύριον ἐκ τοῦ μνημείου, καὶ οὐκ οἴδαμεν ποῦ ἔθηκαν αὐτόν. 3 Ἐξῆλθεν οὖν ὁ Πέτρος καὶ ὁ ἄλλος μαθητής, καὶ ἤρχοντο εἰς τὸ μνημεῖον. 4 ἔτρεχον δὲ οἱ δύο ὁμοῦ: καὶ ὁ ἄλλος μαθητὴς προέδραμεν τάχιον τοῦ Πέτρου καὶ ἦλθεν πρῶτος εἰς τὸ μνημεῖον, 5 καὶ παρακύψας βλέπει κείμενα τὰ ὀθόνια, οὐ μέντοι εἰσῆλθεν. 6 ἔρχεται οὖν καὶ Σίμων Πέτρος ἀκολουθῶν αὐτῷ, καὶ εἰσῆλθεν εἰς τὸ μνημεῖον: καὶ θεωρεῖ τὰ ὀθόνια κείμενα, 7 καὶ τὸ σουδάριον, ὃ ἦν ἐπὶ τῆς κεφαλῆς αὐτοῦ, οὐ μετὰ τῶν ὀθονίων κείμενον ἀλλὰ χωρὶς ἐντετυλιγμένον εἰς ἕνα τόπον. 8 τότε οὖν εἰσῆλθεν καὶ ὁ ἄλλος μαθητὴς ὁ ἐλθὼν πρῶτος εἰς τὸ μνημεῖον, καὶ εἶδεν καὶ ἐπίστευσεν: 9 οὐδέπω γὰρ ᾔδεισαν τὴν γραφὴν ὅτι δεῖ αὐτὸν ἐκ νεκρῶν ἀναστῆναι. 10 ἀπῆλθον οὖν πάλιν πρὸς αὐτοὺς οἱ μαθηταί. 11 Μαρία δὲ εἱστήκει πρὸς τῷ μνημείῳ ἔξω κλαίουσα. ὡς οὖν ἔκλαιεν παρέκυψεν εἰς τὸ μνημεῖον, 12 καὶ θεωρεῖ δύο ἀγγέλους ἐν λευκοῖς καθεζομένους, ἕνα πρὸς τῇ κεφαλῇ καὶ ἕνα πρὸς τοῖς ποσίν, ὅπου ἔκειτο τὸ σῶμα τοῦ Ἰησοῦ. 13 καὶ λέγουσιν αὐτῇ ἐκεῖνοι, Γύναι, τί κλαίεις; λέγει αὐτοῖς ὅτι Ηραν τὸν κύριόν μου, καὶ οὐκ οἶδα ποῦ ἔθηκαν αὐτόν. 14 ταῦτα εἰποῦσα ἐστράφη εἰς τὰ ὀπίσω, καὶ θεωρεῖ τὸν Ἰησοῦν ἑστῶτα, καὶ οὐκ ᾔδει ὅτι Ἰησοῦς ἐστιν. 15 λέγει αὐτῇ Ἰησοῦς, Γύναι, τί κλαίεις; τίνα ζητεῖς; ἐκείνη δοκοῦσα ὅτι ὁ κηπουρός ἐστιν λέγει αὐτῷ, Κύριε, εἰ σὺ ἐβάστασας αὐτόν, εἰπέ μοι ποῦ ἔθηκας αὐτόν, κἀγὼ αὐτὸν ἀρῶ. 16 λέγει αὐτῇ Ἰησοῦς, Μαριάμ. στραφεῖσα ἐκείνη λέγει αὐτῷ Ἑβραϊστί, Ραββουνι (ὃ λέγεται Διδάσκαλε). 17 λέγει αὐτῇ Ἰησοῦς, Μή μου ἅπτου, οὔπω γὰρ ἀναβέβηκα πρὸς τὸν πατέρα: πορεύου δὲ πρὸς τοὺς ἀδελφούς μου καὶ εἰπὲ αὐτοῖς, Ἀναβαίνω πρὸς τὸν πατέρα μου καὶ πατέρα ὑμῶν καὶ θεόν μου καὶ θεὸν ὑμῶν. 18 ἔρχεται Μαριὰμ ἡ Μαγδαληνὴ ἀγγέλλουσα τοῖς μαθηταῖς ὅτι Ἑώρακα τὸν κύριον, καὶ ταῦτα εἶπεν αὐτῇ. 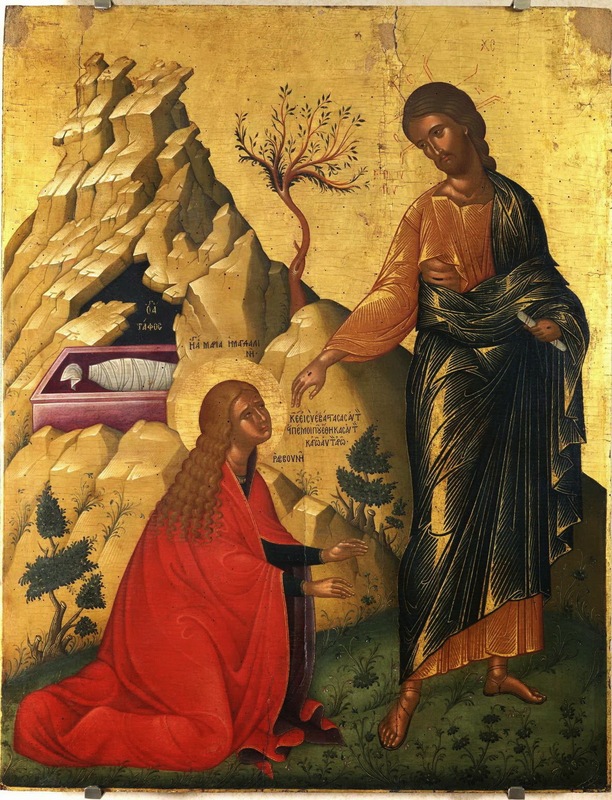 1 Early on the first day of the week, while it was still dark, Mary Magdalene came to the tomb and saw that the stone had been removed from the tomb. 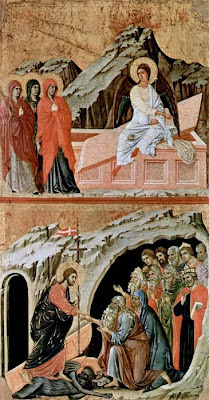 2 So she ran and went to Simon Peter and the other disciple, the one whom Jesus loved, and said to them, ‘They have taken the Lord out of the tomb, and we do not know where they have laid him.’ 3 Then Peter and the other disciple set out and went towards the tomb. 4 The two were running together, but the other disciple outran Peter and reached the tomb first. 5 He bent down to look in and saw the linen wrappings lying there, but he did not go in. 6 Then Simon Peter came, following him, and went into the tomb. He saw the linen wrappings lying there, 7 and the cloth that had been on Jesus’ head, not lying with the linen wrappings but rolled up in a place by itself. 8 Then the other disciple, who reached the tomb first, also went in, and he saw and believed; 9 for as yet they did not understand the scripture, that he must rise from the dead. 10 Then the disciples returned to their homes. 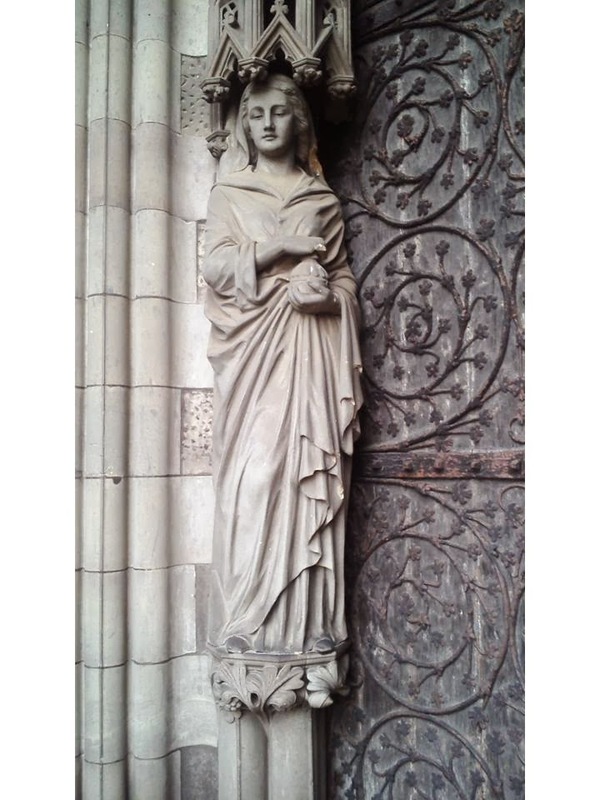 11 But Mary stood weeping outside the tomb. 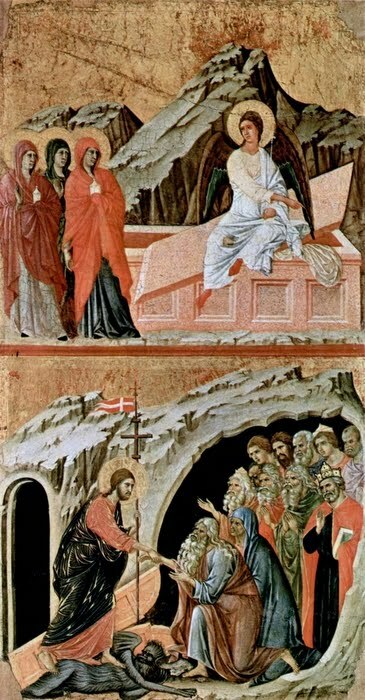 As she wept, she bent over to look into the tomb; 12 and she saw two angels in white, sitting where the body of Jesus had been lying, one at the head and the other at the feet. 13 They said to her, ‘Woman, why are you weeping?’ She said to them, ‘They have taken away my Lord, and I do not know where they have laid him.’ 14 When she had said this, she turned round and saw Jesus standing there, but she did not know that it was Jesus.15 Jesus said to her, ‘Woman, why are you weeping? For whom are you looking?’ Supposing him to be the gardener, she said to him, ‘Sir, if you have carried him away, tell me where you have laid him, and I will take him away.’ 16 Jesus said to her, ‘Mary!’ She turned and said to him in Hebrew, ‘Rabbouni!’ (which means Teacher). 17 Jesus said to her, ‘Do not hold on to me, because I have not yet ascended to the Father. But go to my brothers and say to them, “I am ascending to my Father and your Father, to my God and your God”.’ 18 Mary Magdalene went and announced to the disciples, ‘I have seen the Lord’; and she told them that he had said these things to her. Then were they glad when they saw the Lord. you have delivered us from the power of our enemy. Grant us so to die daily unto sin, that we may evermore live with him in the joy of his risen life; through Jesus Christ our Lord. (Revd Canon Professor) Patrick Comerford is Priest-in-Charge of the Rathkeale and Kilnaughtin Group of Parishes and Canon Precentor in the cathedral chapters of Limerick, Killaloe and Clonfert. This sermon was prepared for Holy Trinity Church, Rathkeale, Co Limerick, on Easter Day, 16 April 2017. 10.30 a.m., Saint Mary’s Church Askeaton, Co Limerick. God has rolled away all the big stones that get in the way between you ansd him, between me and him, between us and him. We only have to look for ourselves and to believe. And that is why Easter should be better, is better, that all the Christmases and all the birthdays and all the other special treats rolled together. (Revd Canon Professor) Patrick Comerford is Priest-in-Charge of the Rathkeale and Kilnaughtin Group of Parishes and Canon Precentor in the cathedral chapters of Limerick, Killaloe and Clonfert. This sermon was prepared for Saint Mary’s Church, Askeaton, on Easter Day, 16 April 2017. 9 a.m., Saint Brendan’s Church, Kilnaughtin, Tarbert, Co Kerry. (Revd Canon Professor) Patrick Comerford is Priest-in-Charge of the Rathkeale and Kilnaughtin Group of Parishes and Canon Precentor in the cathedral chapters of Limerick, Killaloe and Clonfert. This sermon was prepared for Saint Brendan’s Church, Kilnaughtin, Tarbert, Co Kerry, on Easter Day, 16 April 2017. Throughout Lent, I have invited you to join me on a pilgrimage and journey to Gethsemane, Calvary and the tomb. Easter Morning has dawned, and this morning we celebrate and rejoice in the Resurrection. Last night, I presided at the Easter Eve Eucharist and preached in Castletown Church, Pallaskenry, Co Limerick. This morning I am presiding at the Eucharist in Saint Brendan’s Church, Kilnaughtin, Tarbert, Co Kerry (9 a.m.), Saint Mary’s Church, Askeaton, Co Limerick (10.30 a.m.), and Holy Trinity Church, Rathkeale, and preaching in all three churches. In the articles and prayers in the prayer diary, USPG was inviting us to investigate what it means to be a disciple of Christ. The Lent study course, ‘Living an Authentic Life’ (available online or to order at www.uspg.org.uk/lent), explores the idea that discipleship and authenticity are connected. Hallelujah! He is risen! Today we celebrate the hope we have in Jesus Christ. ‘Do not be alarmed; you are looking for Jesus of Nazareth, who was crucified. He has been raised; he is not here. Look, there is the place they laid him’ (Mark 16:6). He has been raised from the dead! Hallelujah! Let us praise God for the gift of the resurrection! May we share this Easter gift so that all may know the joy of new life. God has not left us alone – he has given the Holy Spirit for all people so that together we might enjoy fellowship. And as we spend time together in listening, prayer and shared work, may we learn better what it means to be a disciple and share God’s love. As disciples, may we stand shoulder to shoulder – locally and globally – in seeking and seeing God’s Spirit in everyone, not judging, but forgiving, accepting others as God accepts us. And in this way, together, might we enjoy the fullness of life. Holy God, in the raising of Jesus you bring new life to us all. in the power of your spirit and in union with Christ.